“Reach the 3 million.” This was the slogan appearing on the white T-shirts that all Managers of Kempinski Seychelles Resort Baie Lazare wore on March 24th in commemoration of World TB (tuberculosis) Day. The team of Kempinski Seychelles worked in close partnership with the Ministry of Health to organize a day of awareness and activities to sensitize and encourage their team members to be responsible for their own health, and pass on a clear message to everyone that "we can make a difference." 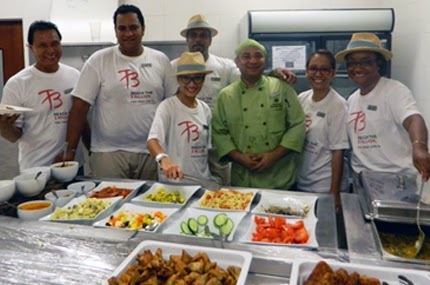 During lunch time, all Head of Departments and Managers including, the General Manager himself, were to serve lunch to the staff in the staff canteen, with their TB shirt especially designed for that day. Mr. Kevin Perine, the resort’s General Affairs Manager who was the one responsible for organizing the activity, said that this is an event that will appear on the calendar of Kempinski Seychelles every year to commemorate world TB day.